Scott is the best! He helped me figure out my login (darn it capslock! lol) and print my document, he emailed me back so fast! What is a Rental Agreement Form? A rental agreement form, is a contract between the tenant and the landlord. This contract is a legal statement which covers everything in regard to a rental by a tenant of a tangible property. The rental agreement will cover the basic data expected from this sort of contract. The basics include the individuals names, the address of the property and the specific details of the rental agreement. These details include the length of the contract and lease, as well as payment details. 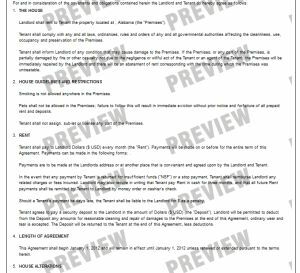 Rental agreement forms can also include much more information. You may want to list the tenants responsibility in regard to the property they are leasing, or mention any utilities or amenities included. If there is ever an issue between a landlord and a tenant, the rental agreement form can be your only means of protection. You have to make sure that you cover everything in the form so that if an issue arises later, everything is in black and white. Our Rental Agreement Form covers everything you could possibly imagine when it comes to writing up a rental agreement contract, and will save you many headaches later! Why do you need a Rental Agreement Form? You need a rental agreement contract between you and your tenant to legally cover all the specifics related to the tenant renting your property. Even if it is a friend or family member renting your property, you need to have a rental agreement form between the both of you. Rental Agreement contracts will always cover you, and protect you in the case of any unforeseen incidents. At their very basic level, a Rental Agreement Contract will cover all the information in regard to rent amount and payment requirements, and information about the length of the contract. Rental agreement contracts also factor in all the rights and obligations of both the tenants and landlords. Attempting to provide a list of Rental Agreement Templates is impossible due to all the different options and possibilities you need to factor in when it comes to making a rental agreement. A rental agreement template just wouldn’t work due to the variations in every rental agreement. Separate rental agreement templates would need to be generated based on whether the property was an apartment, a house, a basement or a room. The rental agreement template would also have to provide information on bedrooms, bathrooms, pets, smoking, parking, utilities and a thousand other factors. Wading through a thousand rental agreement templates would be counter-productive for you. That’s why DIY Landlord Forms covers everything you need in our Rental Agreement Template Generator. Everything you could even think of(and a few things you wouldn’t!) is covered to make your life easier. No need to spend hours on research – whether it’s a room, a house, a basement or a mobile home that you’re looking to rent out; just fill in the data in our Rental Agreement Generator and you’re good to go in mere minutes. Where do I get a Rental Agreement Form? There is no “one” rental lease agreement – every form is different based on factors like amenities, utilities, rules and regulations. Our form for rental agreement generator is all you need to get started in creating your very own rental agreement within minutes. If you would like to see a sample rental agreement form, simply click here: Rental Agreement Form, and you can generate a sample rental agreement form to see exactly what it looks like, and an idea of what a rental agreement contract should cover. What do I need to put in a Rental Agreement Form? What you need to put in a rental agreement form differs depending on many factors. It depends on the state regulations, what the rental property is, what the payment requirements are and many other factors. Don’t give yourself a headache over this – let us do the work for you, with our rental lease agreement form. Depending on what state you live in, certain details and rules may need to be included in the rental agreement. There’s no “catch-all” rental agreement – the details in a Texas rental agreement could be vastly different from the details in a Chicago rental agreement. Information in a California Association of Realtors rental agreement isn’t going to be required in a Wisconsin rental agreement. Our rental agreement generator is state-specific: whether you’re looking for a South Carolina rental agreement or a Utah rental agreement, we have everything covered and do the hard work for you. For more information, see our rental agreement form. With the amount of options and information required to generate a rental agreement form, it would be impossible to give away free rental agreement forms. Literally thousands of hours of work have been put in by us to make sure our rental agreement lease generator is up to state specific standards, and covers everything a landlord could ever need when it comes to creating a rental agreement. If you find a free rental lease agreement online then just remember – you get what you pay for! These documents are most likely inaccurate, won’t cover state specific information, and won’t be easy to edit. We’ve given you the lowest possible price we could offer when it comes to rental agreement forms. Our rental agreement templates are simple to generate, highly customizable and constantly updated so that they remain accurate. If you’re not happy with the rental agreement we provide then don’t worry – we offer a 100% money back guarantee. Stop tearing your hair out trying to find a free rental agreement template and head on over to our rental agreement application form.